Another weekend, another great event. This weekend, Becky and I, along with Todd, Katie, their son Tyler, Lindsey and Kevin, (quite a crew I know) made the 8 hour drive to VA Beach. Well, I guess that's not entirely true. Since our crew had outgrown just one vehicle, Becky and I headed down after the others and we met up down there at the Oceanside Howard Johnson's. Oh ya, HoJo's, nothing but the best for this posse. While it wasn't the lap of luxury, it was an ocean view room right on the beach. 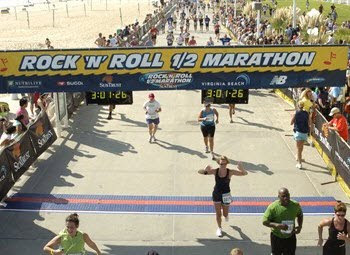 So why the Virginia Beach Rock and Roll Half Marathon? Blame Katie. 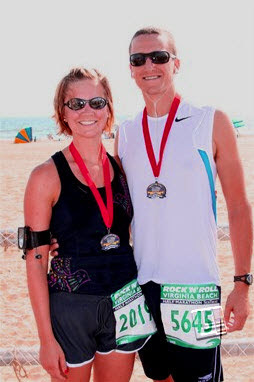 A few years back Katie wanted to do a half marathon and found this one. At the time I was over 200 lbs and just a tad bit out of shape. Well, monstrously out of shape, and on a whim (sound familiar) said that I would do it along with her. I trained a bit, did a few 5K's and before I knew it we were running in VA. It was crazy hot, took me over 2 and a half hours to finish but it was a start. I didn't really think that I'd get into running but I've found that having these types of events looming on the calendar helps get me off the couch and having lost 50 lbs since starting them is a good reason to keep it up as well. Back to the weekend. Since Beck and I didn't arrive until late Friday, we missed the Boys II Men concert that was one of three concerts included with the race entry. You read right. Boys II Men. More like Men II Geezers theses days and I can't say we missed it, we just didn't make it to the show. Saturday morning was bright and sunny and we spent most of the day at the beach. We headed to the expo to pick up my race bib in the afternoon and then spent the evening waiting for a table at the Waterman Restaurant. After almost 2 hours they finally sat us at two separate tables. Not awesome. Lucky for them, their food and especially beverages (best margarita ever) helped us forget about the inexperienced hostess and soon enough we headed back to the hotel. The best thing about our room was that it was on the second floor looking right onto the VA beach boardwalk. If you've ever been to VA Beach, you know what a show can be had just watching the people on the boardwalk so after dinner, Todd, Kevin and I had a couple more beers (great pre race training I know) and had a blast watching the mix of people stroll, bike, run, argue, stumble and rollerblade by. Encore! Sunday was race day and this year Becky joined Katie and me in running it so the 3 of us were up at 6 am and walked the half mile to the start line. It was a nice morning, a little humid but not as hot as past years. We made it to the start line with just enough time to get into our proper starting corrals and hear the national anthem. Then we were off. I started off very slow which was a very conscious decision. If I'm not careful I can let my competitive nature get the best of me and they said it's a marathon not a sprint for a reason. Taking it out too fast can make the rest of the race a nightmare, learned that lesson during my first half. After the first two miles I realized that I was running too slow to give myself a chance at finishing under two hours as was my goal. As I started to pick up the pace, I saw a woman who seemed too be running just enough faster than me to be a good person to "chase". She turned out to be my rabbit for the next 8 or 9 miles! She was running a great race and was very consistent and right on the pace that I wanted to be at. Around mile 11 I lost her after a water stop but by then I was very near the end and breaking two hours was very possible. 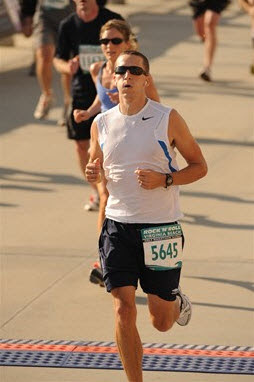 The last mile or so is on the famous VA Beach boardwalk and it's a great home stretch. The heat was getting to me at this point and I was definitely pushing myself for a decent personal time this year. By the time I made the boardwalk I was huffing but determined. 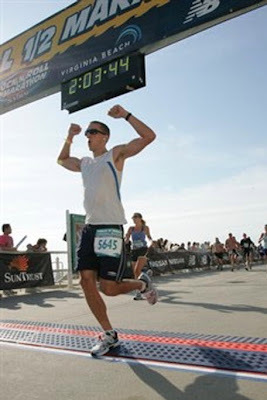 As I was nearing the 13 mile mark, only about 2 tenths away from the finish, I was shooed along with the other runners to the left side of the boardwalk by medical staff working on a fellow runner that had gone down. It was a very terrifying sight to see the staff doing compressions on a fellow runner and I've had a hard time getting it out of my head ever since. I went on to finish in under two hours, 1:59.18 to be exact. I saw the woman that set my pace in the finishing corral and congratulated her and thanked her for unknowingly helping me to a great finish. Becky finished really well, especially it being her first half marathon, coming in at just over 2 and a half hours. This was Katie's first half since having Tyler and did a great job as well. Finished, clock time 2:03.44, official chip time 1:59.18. Have you ever seen someone claim 3400th place so hard? Double fist pump...wow. Becky finishing like a champ...also a fan of the double fist pump apparently. Still smiling even after 13.1 miles. That night we saw The Truth and Salvage Co. and The Black Crowes at the race feature concert. We knew the Black Crowes would be good and they were, but I had no idea that Truth and Salvage Co. would be so great. Check them out if you get the chance. The only major downer of the weekend was the fate of the fallen runner that I saw on the home stretch. While the race medical staff responded very quickly and did everything that they could do, the runner didn't make it. My thoughts and prayers go out to his family and siblings. He was a 23 year old healthy kid and the cause has yet to be released. It's pretty scary to see someone in their final moments as a result of participating in an event that you're participating in. Crazy. It's a stark reminder that life is so very fragile and that pushing it during these endurance challenges can have consequences. We all do our best to prepare and hope to run or ride a smart race, but I guess you never know. Thanks for checking out my blog, if you can donate to the cause please check out my fundraising page. Thanks for all your support!